This is the Easter of all things decadent! 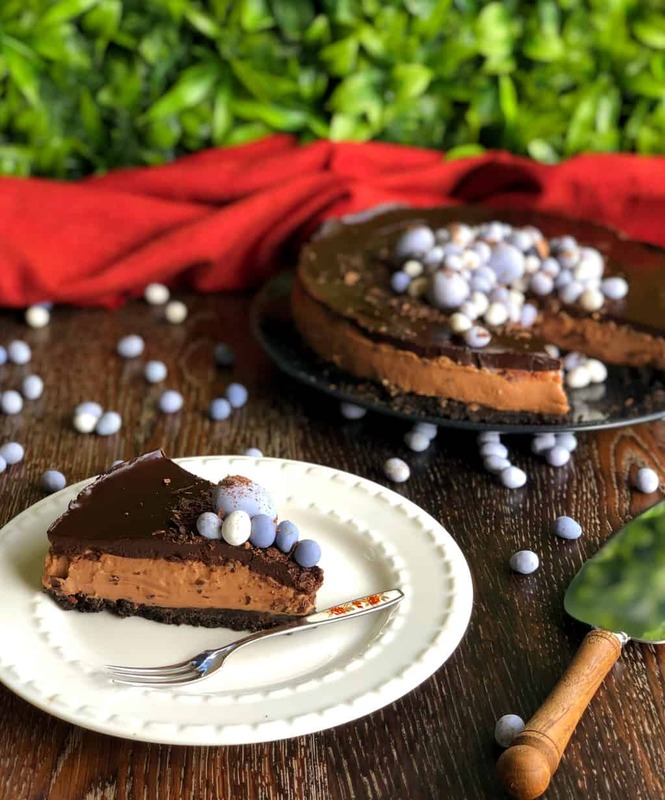 This Triple Chocolate Easter Cheesecake is so easy to make, delicious and perfect for a special family treat any time of the year! I have a special girl I would like you to meet, her name is Ruby and it was love at first sight! 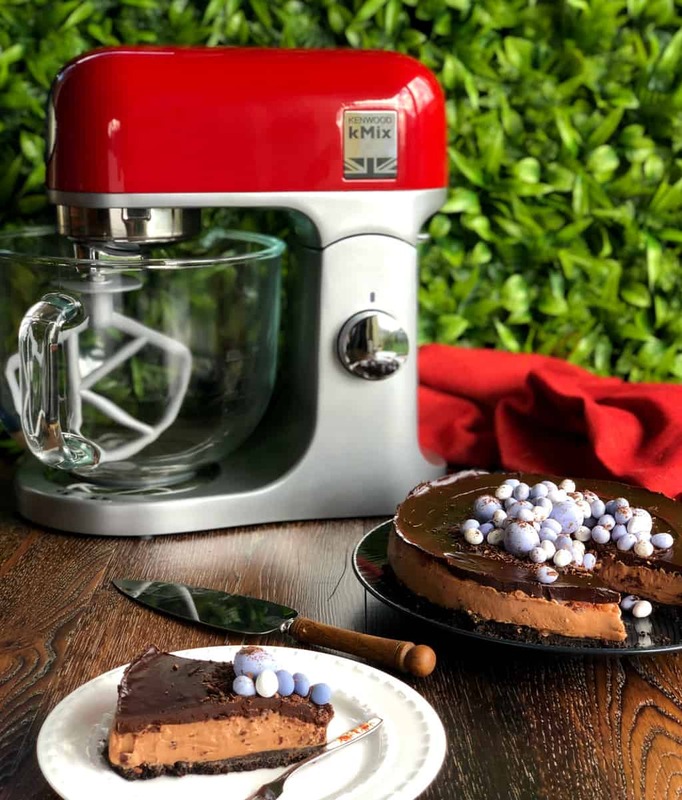 A few weeks ago Noel Leeming reached out and asked if I would like to share with you a little about the gorgeous Kenwood KMix mixer. You can imagine how quickly I said yes! A mixer in my house gets quite a work out as you can imagine, Kenwood is such a long standing trusted brand I was delighted to give it a test run. And it is Spicy Red! 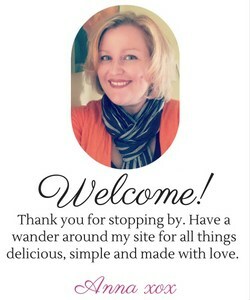 You can find out more about the features and any specials here on the Noel Leeming website! My mixer arrived the other day and I am absolutely delighted with it, not just the colour although it is gorgeous. It is such a sturdy machine with a huge capacity glass bowl. All the attachments you require and all you need to do is unpack and get baking! I love the little touches, such as “Happy Baking” written on the bowl base and the understanding of what a home baker needs and wants. I am so stoked with it over on Instagram we had heaps of name suggestions and I settled on Ruby. I knew that the recipe I wanted to create to test would be a cheesecake. 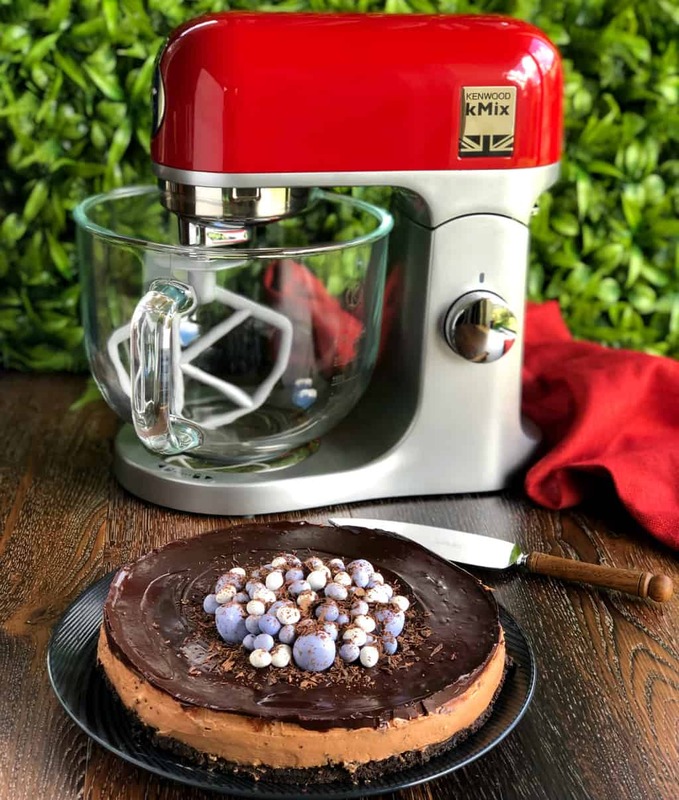 It is one of my favourite ways to use a mixer, creating a smooth creamy luxurious silky cheesecake is a great way to put a mixer to the test. And it did not disappoint! It sounds lovely and smooth, strong and was more than up to the task. 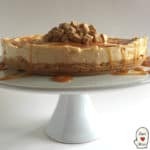 The cheesecake is based on my favourite simple cheesecake you will find in several places on my blog. It is so versatile using just a few simple ingredients and no fancy or fussy techniques. The base is made with oreos to give a lovely chocolately richness and a great dark colour. You could easily sub this for the more traditional wine biscuits if you felt it might be too rich for you but it is extra special. The filling is a milk chocolate cheesecake. I have used Whittakers Creamy Milk as it is my favourite chocolate of all time, lovely flavour and smooth texture. It is a simple combo of cream cheese, thickened cream (which you can find in the supermarket, a whipped cream with thickeners) and a few other simple ingredients and of course the lovely melted chocolate. This whipped up beautifully in the KMix, it would be a lovely addition to a home bakers kitchen. Finally just to be a little bit extra for the occasion I have topped this with a dark chocolate ganche. You can definitely skip this step and serve with a lovely berry dessert sauce, but I recommend for a special occasion you give it a try as it is just an amazing combination. A ganache is a decadent topping that requires just two ingredients, dark chocolate and cream. The method is simple, finely chop a good quality dark chocolate, in this case Whittakers Dark Ghana 72%, and add heated cream, leave for a few minutes to soften the chocolate then whip until it is silky and shiny. Ideally you want to make the cheesecake the day before you wish to serve it. 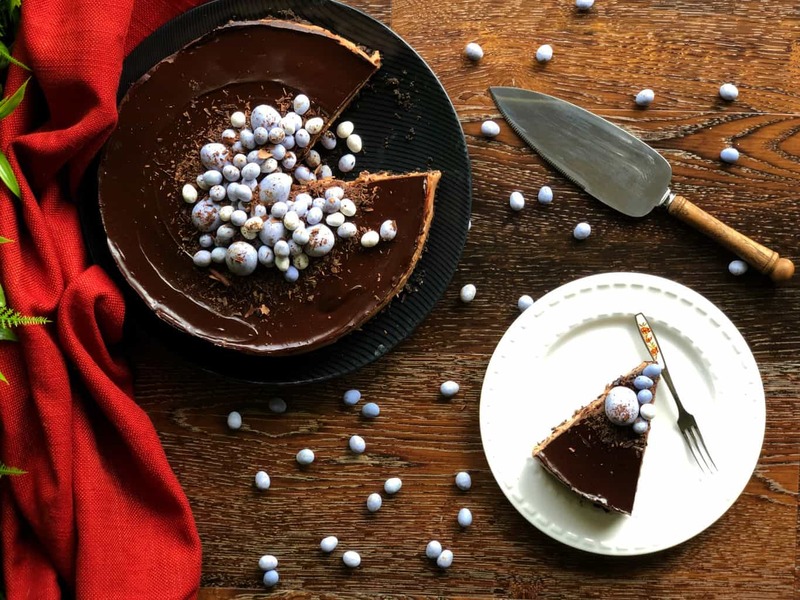 Prepare the base and cheesecake, then you can make the ganache a few hours prior to serving. Although it does keep well if you make it all a day ahead. 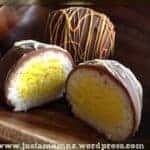 You can decorated it however you choose, some shaved chocolate, easter eggs like I have done for an Easter treat, or simply serve with a dessert sauce or berry coulis. 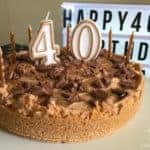 A delicious decadent cheesecake, three layers of chocolate goodness using simple techniques for a divine outcome. 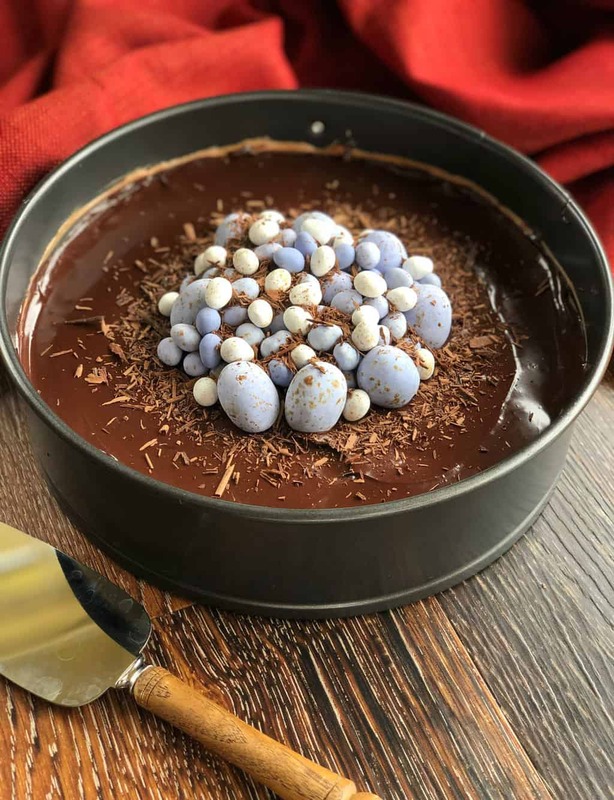 You can serve this with a berry couli or dessert sauce, or top with Easter Eggs as I have done here and shavings of dark chocolate. Prepare a 20-23cm springform tin with baking paper on the base - you can use it in an overhang method by placing a sheet of baking paper over the base, then attaching the top part of the tin over this and attaching in place. Helps to slide off the base once serving. Crush whole Oreo biscuits into a fine crumb in the food processor, add melted butter and blend well. Combine together cream cheese, vanilla and sugar until it is light and fluffy – scraping down the sides occasionally. You really want the mixture to be creamy and satiny to ensure you get the best texture in the end so whip a minute longer than you think you need to. 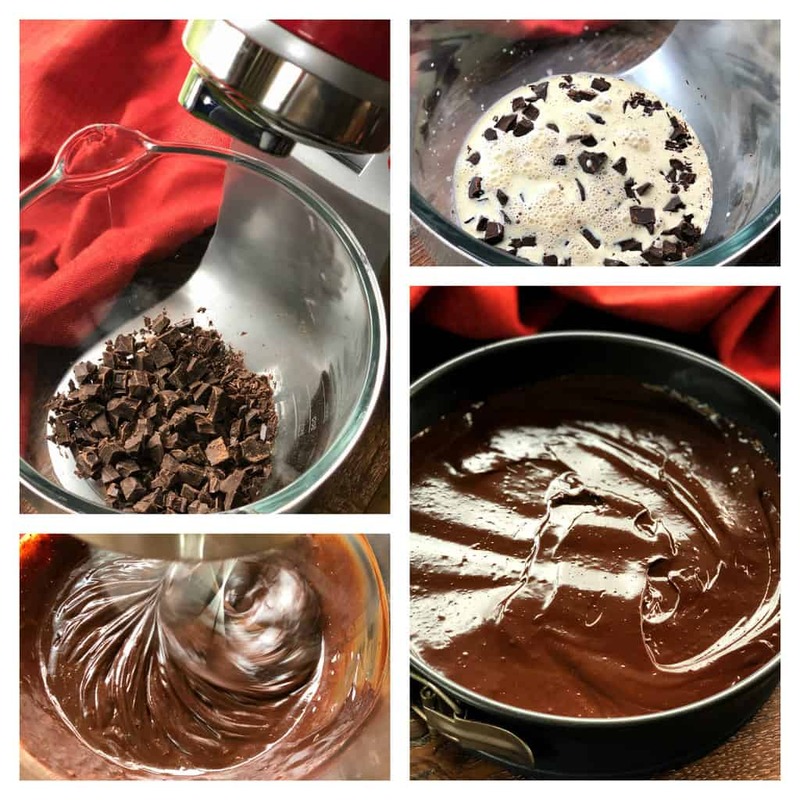 Fold the thickened cream and melted chocolate gently into the cream cheese mixture until well combined – I used the food processor and just put it on lowest speed until just combined. Pour the chocolate cream cheese mixture onto the biscuit base and gently smooth it using a knife. Refrigerate until set – ideally 4-6 hours, but can also be made a day ahead if required. Pour this over the top of the chocolate and allow to stand for 2 minutes before beating until it becomes thick and silky. It will take a little time and look lumpy and pale, but be patient and it will come together. Stir well and pour over prepared cheesecake, add any egg decorations now if using while still not set. Use a slightly warm dry knife around the edge and gently undo the spring from tin, then carefully transfer to a serving plate removing the base of the tin. 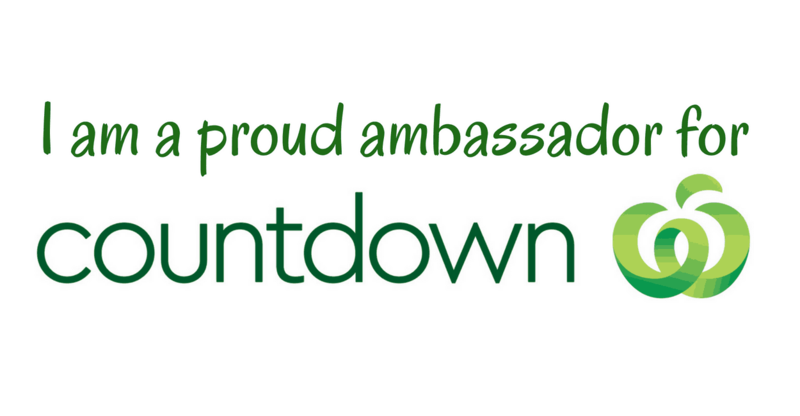 A huge thanks to Noel Leeming for partnering with me, we always shop at our local store as the staff are so lovely so hope to collaborate again soon.